Ye have lost a child: nay she is not lost to you who is found to Christ. She is not sent away, but only sent before, like unto a star, which going out of our sight doth not die and vanish, but shineth in another hemisphere. We see her not, yet she doth shine in another country. If her glass was but a short hour, what she wanteth of time that she hath gotten of eternity; and ye have to rejoice that ye have now some plenishing up in heaven. Build your nest upon no tree here; for ye see God hath sold the forest to death; and every tree whereupon we would rest is ready to be cut down, to the end we may fly and mount up, and build upon the Rock, and dwell in the holes of the Rock. What ye love besides Jesus, your husband, is an adulterous lover. Now it is God’s special blessing to Judah, that He will not let her find her paths in following her strange lovers. ‘Therefore, behold I will hedge up thy way with thorns and make a wall that she shall not find her paths. And she shall follow after her lovers, but she shall not overtake them’ (Hos. 2.6-7). O thrice happy Judas, when God buildeth a double stone wall betwixt her and the fire of hell! The world, and the things of the world, Madam, is the lover ye naturally affect beside your own husband Christ. The hedge of thorns and the wall which God buildeth in your way, to hinder you from this lover, is the thorny hedge of daily grief, loss of children, weakness of body, iniquity of the time, uncertainty of estate, lack of worldly comfort, fear of God’s anger for old unrepented-of sins. What lose ye, if God twist and plait the hedge daily thicker? God be blessed, the Lord will not let you find your paths. Return to your first husband. Do not weary, neither think that death walketh towards you with a slow pace. Ye must be riper ere ye be shaken. Your days are no longer than Job’s, that were ’swifter than a post, and passed away as the ships of desire, and as the eagle that hasteth for the prey’ (Job 9. 25, 26, margin). There is less sand in your glass now than there was yesternight. This span-length of ever-posting time will soon be ended. But the greater is the mercy of God, the more years ye get to advise, upon what terms, and upon what conditions, ye cast your soul in the huge gulf of never-ending eternity. The Lord hath told you what ye should be doing till He come; ‘wait and hasten (saith Peter,) for the coming of the Lord’; all is night that is here, in respect of ignorance and daily ensuing troubles, one always making way to another, as the ninth wave of the sea to the tenth; therefore sigh and long for the dawning of that morning, and the breaking of that day of the coming of the Son of man, when the shadows shall flee away. Persuade yourself the King is coming; read His letter sent before Him, ‘Behold, I come quickly.’ Wait with the wearied night-watch for the breaking of the eastern sky, and think that you have not a morrow. I am loath to weary you; show yourself a Christian, by suffering without murmuring; — in patience possess your soul: they lose nothing who gain Christ. I commend you to the mercy and grace of our Lord Jesus. The Several Thrones of God, with Particular Attention Paid to the Throne of Grace, which is the Mercy-Seat in the Old Testament. Written by Robert Traill, March 25, 1696. …the same of which the apostle Paul calls the “Throne of Grace”; from which he teaches us, that whatever of divine grace was revealed and tendered to, perceived, and received by the faith by the Old Testament believers, and was employed in the right use of this sacred old institution of God to his church, –the same, with greater advantages, the New Testament believers enjoy under the New Covenant in Jesus Christ; who is the body, antitype, and substance of all of them. But we find three most solemn things in the Old Testament, which the Mercy-Seat (the type of the Throne of Grace in the New Testament) was applied to. The most solemn approach was made unto God, which was effectuated when the high priest going in once a-year to the holiest of all, where the Mercy-Seat was located, made atonement for the people. This approach was made, not by the common people in their own persons; nor by any ordinary Levite, who were even privileged with a greater nearness to God than the people –Numbers 16:9, nor by any of the inferior priests of the house of Aaron, to which family the office of priesthood was by divine appointment confined; nor by the high priest himself, except only once a-year, and that at a specific, determinate time, and carried out with many appointed ceremonies of preparation and performance. Some accounts tell us of a custom in their Worship, that music, performed by singing and instruments, were used by the people, to express their joy and praise, when the high priest returned safely out from that sacred and awful place, the holy of holies. The most solemn atonement for the sins of Israel was made at the Mercy-Seat. This was done in that yearly entrance of the high priest into the holiest of all, Leviticus 16:12-14, especially verse 14. – “And he (Aaron, the first of that order of priests) shall take of the blood of the bullock, and shall sprinkle it with his finger upon the mercy-seat eastward: and before the mercy-seat shall he sprinkle of the blood with his finger seven times. Verse 30. On that day, shall the priest make an atonement for you, to cleanse you, that ye may be cleansed from all your sins before the Lord. The most solemn answers were given by God to the high priest, Exodus 25:17-22, where we have the institution of the Mercy-Seat, and/or the form of it: And there ( says the Lord) I will meet with thee, and I will commune with thee”; and again, ” Exodus 30:6. What the Old Testament Urim and Thummim was, and what their Shechinah was, neither Jew now nor Christian know, –though they guess; only that these were some special manifestations of the grace, and favor, and mind of God, which expired with some of them it is thought, before the end of that ministration. But all these three glories, and dignities, and advantages of their mercy-seat, are all to be found in Christ Jesus. For it is Jesus who represents his people before God, and presents them to the Father; since he has made the perfect atonement for all his Israel, and declares to his church all the saving will of God, which he heard and received of his Father. The truth I would speak to is this: That the God in the gospel, sits on a Throne of Grace, and from it calls and invites sinners to come to him. “Let us come to the Throne of Grace”, certainly means, “Let us now come to God sitting on the throne of grace”; let us take both the direction and encouragement to come to God, because he is on a throne of grace. We find a throne of glory much spoke of, for it is a throne of the essential, incomprehensible glory of God. This no man can approach. Of this the apostle spoke of in, 1 Tim. 6:16. He dwells in light that no man can approach to, whom no man hath seen, nor can see. Marvelous is this light. We find the more light there be in or about a person or thing, the more easily and clearly it is perceived as the sun is such a glorious body, that though it be at a vast distance from the earth we dwell on, we yet can see it with our eyes immediately. As soon as it shines, we can see it, because of its light. It is its own light, and nothing else, that exists is like it. If the sun did withdraw its own light, all the eyes of men, and all the artificial fire and light men can make, would ever help us to replace or match it. But such is the majesty of God, that he is clothed with it, Psalm 93.Men are dazzled and confounded by a little ray of his glory; but with God is terrible majesty, Job 37:22. This is not the throne we are called to come unto. And they are but dabblers in religion, that know not in their experience how overwhelming the views and thoughts of God’s majesty and glory are, when he is not seen as on a Throne of Grace. ‘I remembered God, and was troubled, says one saint, Psalm 77:3. I am troubled at his presence when I consider, I am afraid of him, said another, Job 23:15. No wonder Manoah said unto his wife, “We shall surely die, because we have seen God.” Judges 13:22. when a view of the heavenly glory of Jesus Christ makes John, who was often to lean on his bosom in his humbled state, to fall down at his feet as dead, Revelation 1:17. There is a throne of God’s Government of the World often spoke about, Psalms 9:4, 7. On this throne God sits, and rules all things at his pleasure, and infinite wisdom. This throne is to be believingly regarded by us; but it is nor the throne of grace that sinners are called to come unto for grace and mercy. There is a throne of God’s justice spoken of. This is that throne David deprecates his being brought before, Psalms 143:2. Enter not into judgment with thy servant: for in thy sight shall no man living be justified. If a man be wronged and oppressed by men stronger than he, he may appeal to this throne of justice, and expect redress. BUT if a man’s business be with God, he should be afraid of this throne of justice. Men are often proud and vain in their thoughts, and before others: but if the Lord call them before this high court of justice, they will surely be cast Job 9:2, 3. How should a man be just with God? If he will contend with him, he cannot answer him one in a thousand. When God sits on a throne of justice, to judge men according to his law and their works, nothing but condemnation can justly be pronounced on sinners. Whoever he be of sinful Adam’s seed that expects the saving favor from God’s throne of justice, will find himself woefully deceived. We find the throne of the last judgment. Before this all must appear, 2 Cor. 5: 10. Rev. 20:12. This is not the throne of grace in the text. No grace nor mercy is shown to any from this throne, especially to them that have despised and spit at the throne of grace before. And when our Lord comes, and sits on the throne of his glory, Matthew 25:31; no sinner that hath despised his grace now, will find any quarter then, Luke 19:27. What then is this throne of grace? It is God in Christ dealing with men according to the grace of the gospel. It is God in Christ reconciling the world to himself, not importing to them their trespasses 2 Cor. 5:19. It is Christ set forth by God to be a propitiation, Romans 3:25. This is the true mercy-seat, or throne of grace, or propitiation, 1 John 2:2 and 4:10. This is the new court or throne erected by God, and declared in the gospel, to which sinful man is invited to come. Continuing on from what is said by the apostle’s alluding to the mercy-seat in the tabernacle and temple of old. It is called a throne, because of the glory and majesty of God is manifested there. God’s condescending to display and to dispense his grace and mercy to sinners. This dispensing of Grace is not debasing to God, but is an advancement of his glory. When he gives grace, he acts royally, and as a King, with majesty. Araunah’s offering to David, is said to be like a king, 2 Sam. 24:23. But Araunah was no king, he was only a subject; however, he had a free, and noble heart. The Lord on his throne of grace, dispenses all acts of grace with great majesty, and as a King; and not as a King, Judge, and Ruler, but as a King, Benefactor, and Giver. This royalty of grace shines, in the greatness of his gifts, especially in the greatness of his gifts of grace and mercy. These gifts are vastly above all that creation can give. And in its manner of giving; it is free, sovereignly free. Grace and mercy is God’s own and he does with them as he will. When Moses prays, Exodus 33:18. I beseech thee, shew me thy glory, we cannot conceive what was in his holy, and heavenly heart. He was now just come down from the mount for the first time; he is going up again to spend another forty days there, in such communion with God as never mere man enjoyed before or since out of heaven; he has prevailed with God for Israel, and has received a most gracious answer, ver. 17. And the Lord said unto Moses, I will do this thing also that you have spoken; for you have found grace in my sight, and I know thee by name. What means Moses then by his prayer ver. 18. Whatever he meant, the Lord’s answer is much to be observed, ver. 19. And he said, I will make all my goodness (or beauty) pass before thee, and I will proclaim the name of the before thee. (What is in this name that hath so much of glory and goodness in it, as should satisfy such a mighty hungerer for more of God, as Moses was. I will be gracious to whom I will be gracious, and will show mercy on whom I will show mercy. God’s glory shines highly, in his being the sovereign disposer of his own grace and mercy, and happy is the believer that adores this glorious sovereignty. Paul in Romans 10:15, makes a deep improvement of it. Jeremiah 17: 12 A glorious high throne from the beginning, is the place of our high sanctuary. See then that you, in all your pleadings for grace and mercy, remember that you are before a high stately throne. 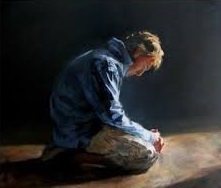 Approaches to God on the throne of grace, should be managed with the deepest reverence and humility. So did the publican, when he came to it, Luke 18:13. God be merciful (propitious) to me a sinner, (or me the sinner, the great singular sinner. So the Greek runs, as Luke: 7:37, 39. The deepest, profoundest adoration of the glorious majesty of God, is performed by a self-condemned sinner, pleading at this throne for the obtaining of the sovereign free grace of God. Lastly; It is called a throne, because grace reigns and is enthroned there: Romans 5:21. Grace reigns through righteousness unto eternal life, by Jesus Christ our Lord. Blessed reign! And blessed are all that are under the reign and dominion of the grace of God. Sin reigns through the unrighteousness of the first Adam unto eternal death, if men be left alone, and if grace do not break this reign of sin. And grace reigns through the righteousness of the second Adam unto eternal life. And nothing can dethrone grace; it will prevail, and reach its end, eternal life, in all it falls upon. ‘0 that captives to Satan, and slaves to sin and to the law, would long to be under the reign of this stately power, –the grace of God! And that believers themselves would give a more free and large subjection to it! The history of Elijah supplies us with one of the most striking, and, we may add, one of the most instructive, sections of the Old Testament. With him begins the wonderful history of Prophetism. Through him we obtain a glimpse which we would not willingly lose of God’s dealings with His people: His faithfulness to them when they were unfaithful to Him; His unremitting efforts to withdraw them from sin and keep them in that intimate and obedient relation to Him in which alone was safety to be found. At first sight the narrative may appear objective to a fault. We are told nothing of who Elijah was, how he had been trained, whence he came as he passes across the page of history. In the midst of Ahab’s wicked rule suddenly he stands before the idolatrous King and pronounces the curse of God, which for his sake should fall on the land which he had polluted with his apostasy. And as suddenly as he appears, so suddenly he withdraws again. Hidden at Cherith or at Zarephath for a period measured by years, he appears on the scene of public history once again as unexpectedly and as much a messenger from on high as at first. Everywhere he goes the powers of heaven accompany him, and his appearances and disappearances are almost as sudden as the bolts of heaven themselves. But, however rapid the action, and however much, at first view, the narrative may seem to wear the appearance of objectivity; however much it may seem to be concerned only with the history of Israel and God’s endeavour through the words and works of His prophet to awaken His people to righteousness and rescue them from the slough of their idolatry; the story of Elijah yet manages to be primarily and above all else the story of Elijah. Somehow, as in music sometimes a secondary strain is carried on, shot through the dominant theme of the composition, in harmony with it and yet separable from it, and needing but a little emphasizing to make it the chief burden of the whole; so within the bosom of this narrative of how God sent His prophet to Israel with His thunder-message calling it back to the service of Him, of how He dealt thus faithfully with His people and sought to save them from themselves and for Him, there lies, not hidden, but embraced and preserved for us, the touching account of how God dealt with and trained the prophet himself. As Jesus, when He sat in the judgment hall of Annas offering Himself a victim for the saving of the world, yet had time to turn a significant glance upon Peter as he stood denying Him before the courtyard fire, and thus saved His poor repentant follower in the saving of the world; so God in His use of Elijah for the teaching of Israel also found time to train the heart of the prophet himself. These chapters are crowded with teaching for us. We must select, from the wealth they bring to us, some one thing on which our minds may especially dwell to-day. Let it be this instructive element in them: God’s way of training His prophet. Let us observe in the case of Elijah how God dealt with him in His grace so as to bring him to a better knowledge of himself, of God and of the nature of the work to which he was called. When once we approach the narrative with this purpose in view, it becomes difficult to see anything else in it. We forget Israel in Elijah. Israel seems only the instrument upon which and by means of which Elijah’s heart and soul were taught. We have in a word emphasized the subordinate strain until it becomes dominant; and the very possibility of this is a clear proof that the subordinate strain was planted in the music by the Great Composer, and that it was meant that our ears should hear it. We are told, we say, nothing of the early life, the early training, or directly, of the character of Elijah. He appears suddenly before us as the messenger of God’s wrath. Like his great antitype—who was greater, our Lord being witness, than even he—he is a voice from the wilderness crying the one word, Repent! He is the human embodiment of the wrath of God. Wherever he goes destruction accompanies him. Drought, fire from heaven, floods of rain, death for the enemies of God, follow hard on his footsteps. He is embodied law. And as such he is a swift witness against his people. Obedience, repentance, strict account, these form the essence of his message. God chooses appropriate instruments for His work. And we have reason to believe that the sternness of Elijah’s mission was matched by the sternness of his aspect and the sternness of his character. We are therefore justified in having said that he was, not merely the messenger of God’s law and wrath, but their embodiment. He was by natural disposition, as framed under providential circumstances, and by virtue of the side of God which he had as yet apprehended, nothing loath but rather naturally inclined to act as the witness of God against his people, well-fitted to call down the vengeance of God upon them and to delight in the overthrow of His enemies. He was in danger of thinking of God only as a lawgiver and the just avenger of His wounded honour. Hence arose the necessity of the training of the prophet. Every incident of his career, as it is recorded for us, entered into this training. (4) a sense of their essential and broad mercifulness. These lessons are brought home to him by means of two stupendous miracles over nature, wrought for the purpose of teaching the people that Jehovah and He alone is God,—so closely intertwined were the two lines of Divine work, the training of the people and the training of Elijah. No sooner had the prophet declared to the apostate King the word of God sent to him, “As the Lord, the God of Israel liveth, before whom I stand, there shall not be dew nor rain these years but according to my word,” than a special personal message came from the Lord to him saying, “Get thee hence, and turn thee eastward, and hide thyself by the brook Cherith, that is before Jordan. And it shall be that thou shalt drink of the brook, and I have commanded the ravens to feed thee there.” Thus it was brought about that both Israel and Elijah were simultaneously learning the lesson of the littleness of man before God. But diversely. Israel was learning that it could not with impunity break God’s law; Elijah that even God’s servants depend on Him for their every want. The self-willed nation was learning to submit to its Lord; the perhaps too self-confident prophet was learning the weakness of flesh and man’s utter dependence on his Maker. In the silence of the wilderness, hidden in one of those torrent-clefts which fall into the Jordan valley, Elijah was dependent on God’s hand for his daily food; on the water which flowed at first in quantities full enough for his needs over the rocks of the brook’s bed, but gradually grew less and less until it trickled in drops scarcely numerous enough to moisten his parched lips; on food brought to him by the unclean ravens. Thus gradually he learned to sympathize with his suffering fellows and to rest on God. It was meet that he who seemed to have the dominion of the heavens in his hands, who prayed that it should not rain and it rained not, should share in the want which resulted; and should learn to sympathize with poor suffering, even if sinful, humanity, like that greater one who was yet to come and learn also how to sympathize with us through His participation in our griefs. How fully he learned his lesson the subsequent narrative tells us in the beautiful story of his dealings with the widow of Zarephath with her cruse and barrel, and her sick and dying child—one of the most Christlike narratives among all the Old Testament miracles. Thus then as Israel was prepared for repentance, the prophet was prepared inwardly to be a fit messenger to his suffering brethren, bringing them relief from their sore affliction. We repeat . it, God sends His messages by fit instruments. And so, in due time, Elijah comes to bring the famished land relief. We all remember the story of the tremendous scene wherein Elijah—the “prodigious” Tishbite, as an old author calls him—challenges the prophets of Baal to meet him in a contest of worship on Carmel, and defeats them by simply calling on his God; and then draws down rain on the parched ground by the almighty virtue of his prayer. No scene of higher dramatic power is to be found in all the world’s literature. As we read, we see the prophet ruling on the mount; we see him bent in prayer on the deserted summit; we see him when, the hand of God upon him, he girded up his victorious loins and ran before the chariot of Ahab, the sixteen miles through the driving storm, from Carmel to Jezreel. No scene we may say could have been more nicely fitted to his mind or to his nature. Here the king of men was king indeed and his victory seemed complete. But God’s children must suffer for their triumphs. Were there no thorns in the flesh, messengers of Satan, sent of God to buffet them, there would be no one of men who could serve the Lord in the scenes of His triumph without grave danger to his own soul. And Elijah needed to learn other lessons yet. He needed to learn that God’s victories are not of the external sort and are not to be won by the weapons of men. How quickly after the triumph comes the moment of dismay. “And Ahab told Jezebel,” says the simple narrative, “all that Elijah had done, and withal, how he had slain the prophets with the sword. Then Jezebel sent a messenger unto Elijah, saying, ‘So let the gods do to me and more also, if I make not thy life as the life of one of them by to-morrow about this time.’ And when he saw that, he arose and went for his life and came to Beersheba.” Thus, Elijah has his lesson to learn again after his miracle. We need not wonder at his sudden flight. It is the price that strong, fervent spirits pay for their very strength, that they suffer a correspondingly strong reaction. So it was with the prophet’s antitype, John the Baptist, when in the prison he lost his faith and sent to ask Him whom God had Himself pointed out to him on the banks of Jordan, whether, indeed, He was the Coming One. So it was with Peter also, who could venture on the waves, but only to cry, “Lord save me, I perish”; who could draw his sword and smite the High Priest’s servant, but only at once to deny his Lord at the challenge of a servant maid. So now it was with Elijah. God’s hand had been outstretched at his call. He had shut up the heavens at his bidding and had nourished him at Cherith and given him miraculous sustenance at Zarephath, and the widow’s son back from the grave. • He had sent down His fire from heaven and delivered the priests of Baal into his hand and opened the heavens at his prayer. But Elijah could not trust God, now, to deliver him from a woman’s hate; and that, although her very message bore in it the betrayal of her weakness. Was there not a deeper spring for this distrust still? With all his training, Elijah did not as yet know his God. His life had fallen on evil days, times of violence that demanded violent remedies for their diseases. And he could not believe in the efficacy of any but violent remedies. Fresh from Carmel and the slaughter of the priests he was impatient of the continuance of evil, and expected the miracles of Carmel to be but the harbinger of the greater miracle of the conversion of the people to God in a day. When Elijah awoke on the morrow and found Israel altogether as it had been yesterday, he was dismayed. Had then the triumph of yesterday been as nothing? Was Jezebel still to lord it over God’s heritage? What then availed it that the fire had fallen from heaven? That the false priests’ blood had flowed like water? That the rain had come at his bidding? Was the hand of God outstretched only to be withdrawn again? Elijah loses heart because God’s ways were not as his ways. He cannot understand God’s secular modes of working; and, conceiving of His ways as sudden and miraculous only, he feels that the Most High has deserted His cause and His servants. He almost feels bitter towards the Lord who had let him begin a work which He leaves him without power to complete. Hence Elijah must go to the wilderness to learn somewhat of the God he serves. After his first miracle of closing the heavens, he learned what man was in his sufferings and in his needs. Now he has opened the heavens and is to learn what God is and what are the modes of His working and the nature of His plans. There is no mistaking the purpose of God in leading the prophet into the wilderness; nor the import of the teaching He gives him there. The disheartened prophet, despairing of the cause of God because all things had not turned out as he had anticipated, throws himself on the desert sands to die. But there God visits him; and leads him on to Horeb, where the Law had been given, where it had been granted to Moses to see God’s glory, the glory of the Lord, the Lord God, merciful and gracious, slow to anger and plenteous in mercy and truth. Reaching the Mount the stricken prophet seeks a cave and lodges in it. And then the word of the Lord came to him with the searching question, “What doest thou here, Elijah?” We do not need to doubt that there was reproof in the question; but surely it is not reproof but searching inquiry that forms its main contents. The Lord had Himself led Elijah here, for his lesson. And now the Lord probes him with the deepest of questions. After all, why was Elijah there? The question calls for reflection; and reflection which will bring light with self-condemnation; and with the self-condemnation, also self-instruction. “What doest thou here, Elijah?” The honest soul of the prophet gives back the transparent truth: “I have been very jealous” . . . and so on. Here we see distrust in God and despair of His cause; almost complaint of God, for not guarding His cause better; nay, more, almost complaint of God that He had left His servant in the lurch. The Lord deals very graciously with His servant. There is no need now of reproof; only the simple command to go forth and stand upon the mount before the Lord. And then the Lord passed by; first a great, strong wind rent the mountains and brake in pieces the rocks before the Lord; but it was not in the wind that the Lord was. And after the wind, an earthquake; but the Lord was not in the earthquake. And after the earthquake, fire; but the Lord was not in the fire. And after the fire, a sound of gentle stillness. Elijah does not now need to be told where the Lord is. The terror of the storm, of the earthquake, and of the flame, is as nothing to the awesomeness of the gentle stillness. “And it was so, when Elijah heard it, that he wrapped his face in his mantle, and went out and stood in the entering in of the cave.” Did he already begin to suspect that he had mistaken the storm that goes before Jehovah for Jehovah’s self? The terror of the law for the very hand of Him whose essence is love? The terrible preparation for the Gospel for the Gospel itself? But there is still no word of direct instruction. Only the old question still sounds in his ears. “And behold there came a voice to him and said ‘What doest thou here, Elijah? '” To it he returns the same answer as before; but surely in deep humility of spirit. Be that as it may, however, the Lord proceeds to tell him that He has yet work for him to do and sends him back with instructions which imply that there is a long future for the fruition of His plans. And whether at once or more slowly we cannot doubt that the lesson had its effect and Elijah learned not to lose hope in God’s cause because God’s ways in accomplishing it are not our ways. How full all this is of lessons to us! (1) That the cause of God does not depend on our single arm to save it. “I, I only, am left,” said Elijah, as if on him alone could God depend to secure His ends. We depend on God, not God on us. (2) That the cause of God is not dependent for its success on our chosen methods. Elijah could not understand that the ends of God could be gained unless they were gained in the path of miracles of manifest judgment. External methods are not God’s methods. (3) That the cause of God cannot fail. Elijah feared that God’s hand was not outstretched to save and fancied that he knew the dangers and needs better than God did. God never deserts His cause. (4) That it is not the Law but the Gospel, not the revelation of wrath but that of love, which saves the world. Wrath may prepare for love; but wrath never did and never will save a soul. We close then, with a word of warning and one of encouragement. We must not identify our cause with God’s cause; our methods with God’s methods; or our hopes with God’s purposes. God’s cause is never in danger; what He has begun in the soul or in the world, He will complete unto the end.